In his “Small Catechism”, the Rev. Dr. Martin Luther included this question to explain the each part of the catechism. So, in taking a cue from the good Reverend, I am doing something to that effect with this page. To start with, Forklift Theology is not officially endorsed by any particular church body. In fact, there are many church bodies that might accuse me of heresy. Why? Simply because I affirm infant baptism and the real presence in the Lord’s Supper. I will, as I have noted elsewhere, state very plainly that I am a member of a congregation within the Lutheran Church Missouri Synod. Thus, the Lutheran Confessions, as found in the Book of Concord, guides much of what I write. What of the Bible verses I quoted? Am I quoting them out of context? No. I firmly believe that I am quoting scripture correctly. In fact, I generally tend to explain the context of a verse when I am quoting it. The context of the verse is what makes the difference in the Lutheran church, and if it is not in context, it is wrong. I very much refuse to misquote scripture. If a particular verse is too difficult for me to understand, then I figure that my reader would have similar difficulty. So, I never attempt to quote what I don’t or can’t understand in plain language, no attempting to spiritualize or change into a metaphor something that can easily be understood in simple terms. By the way, old bottles don’t usually break when new liquid (alcohol, water, gasoline) are placed in it. That is why I try not to use the King James. I have mentioned both the Book of Concord and the Bible. That may be a concern to some. Do I hold the Book of Concord as being on the same level as scripture? No. The Bible is scripture. It is the word of God. The Book of Concord is summation of the teachings of the Christian faith, as well as a true and accurate expository of scripture. Thus, the Book of Concord is a tertiary source of my writings, with the Bible being primary and my work experiences being secondary. The Book of Concord is only tertiary insofar as it does not address some of the day to day issues that might affect somebody who is not serving in the pulpit, especially in our modern world. This is not to say that the Book of Concord is not relevant, rather it is a matter of understanding how the issues of Dr. Luther’s day still affect us today. Now, I suppose that my personal background might be of some concern. Simply put, what makes me think I am qualified to write any of this? Personally, I think that is a matter of opinion. Here is what I can say. I served in the US Navy from 1993 to 1998. After I got out of the Navy, I worked as a gas station attendant. From there, I worked as an overnight shelf stocker, did some time as a fast food employee, and then got hired on with a construction supply company. I presently work as a forklift operator for an Alaskan shipping company, which is what I have been doing for nearly fifteen years. 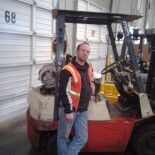 However, it was during my time in the US Navy that I actually learned to operate a forklift. What of my educational background? Truthfully, I studied theology and hold an associates degree from a local, regionally accredited, Bible college. I was studying for a degree in Christian education. However, time and money forced me to cut my education short, thus I have never been able to finish my bachelor degree. However, I do have other training beyond just college and my work experience. I have taken several courses by FEMA (Federal Emergency Management Association), a CERT (Community Emergency Response Team) course, and presently hold an Extra class Amateur Radio license. I am also a registered Volunteer Examiner (VE), and am studying for my GROL (General Radiotelephone Operator License). As for my church background. I have been around. I have attended Roman Catholic services, and Pentecostal services. I have been a professing Baptists, and an Agnostic. I have even spent time in mysticism. To that end, though I was baptized Lutheran in 1980, I have not always professed my faith as a Christian of the Lutheran tradition. How I got to where I am today is a longer story than I care to discuss. However, it was through a careful study of certain doctrines and what the Bible really says that brought me to the Lutheran church. As noted above, context makes a difference. Now in the comments I have seen, I get asked some rather odd things. One I see quite often is about the popularity of this blog. I also get plenty of people offering all sorts of dubious means to make it go “viral”. Truthfully, I don’t want that. I don’t rightly care if this blog is never popular. I don’t write it for the sake of popularity. If I wanted popularity, I’d try out for America’s Got Talent (I play harmonica for my church). I write this blog for truckers, warehouse workers, and the average person who might not be able to attend church regularly. As I am not a pastor, I write from the view of a guy who shares the same experiences as anyone else. Yep, just observations about the Christian faith as understood by a forklift operator who is a member of the Lutheran Church Missouri Synod. Another rather odd comment I get is about a “donate” button. Let me put this way, Forklift Theology is NOT a business. If I wanted to go into business, especially in light of Radio Shack closing down, I’d start an electronic component supply business. At this point in my life, I may consider that, but I am not particularly interested in pursuing such an objective. So, I am unlikely to ever consider adding a “donate” button. In fact, I would much prefer that you simply give to your local church body, they need it more than I do. Where is this going? Truthfully? I don’t know. I started this nearly three years ago with no real plan. I simply decided to make another attempt at blogging. Another? Yes. I used to write the blog “Lutheran Sage” over on Blogspot (seems it has long since been deleted). That blog was an utter failure. Among other problems, I sought to avoid personal pronouns and thus accountability. Additionally, as it had no real target (such as forklift operators or warehouse employees), it was difficult to write about much. So far, Forklift Theology has been for successful. How long do I expect it to continue? I don’t really know. Might be six months, might be a year, maybe longer. What I do know is that even if I stopped writing tomorrow, there would still be more to write and hopefully somebody to write it. Is Forklift Theology unique? Yes and no. There have been other blogs and bulletin boards which posted about the concept of “Forklift Theology”. However, reading those, I find that they are all fatally flawed. One discussed the idea of God’s ways being backwards to our normative thinking, using the controls on a forklift to illustrate his point. Problem, most of us grow up with the idea of push down and pull up, which is how most forklift controls operate. To this end, somebody with no forklift experience is not in a good position to write about “forklift theology”. Additional blogs and bulletin board posts seems socialistic in nature and have something to do with the idea of mounting machine guns onto forklifts. Not certain how that relates to theology. Seems foolish to me, and possibly even threatening. Socialists have no business writing about theology. I write Forklift Theology to reach out to those who can not regularly attend church. I write from the view of the guy who sits in the pew on Sunday. Simply put, I just write about the Christian faith from the view of a forklift operator and about living that faith in a fallen, sinful world. That is Forklift Theology in a nutshell.